In a tragic incident, a father and his first wife have allegedly poisoned three children of the family to death at Bir Amin village, near here. His second “wife” was also poisoned and her condition is stated to be serious. A piquant situation prevailed in the local District Education Office here today when two district education officers (DEOs) were found for one post, one having government orders of his promotion and posting at Fatehabad, while the other equipped with the Punjab and Haryana High Court's orders staying her recent transfer orders. Jitender, who, along with Vijay, was harvesting at a granary at sarpanch Ramphal’s farm at Mumtazpur village near Kosli was allegedly killed by the latter with an iron rod yesterday. The Congress today received a jolt when four of its active members resigned from the primary membership of the party. They are Jangbir Singh, ex-MP and member, HPCC, Ganpat Ram, ex-MLA and former member of the HPSC, Dharmpal Sangwan, ex-MLA, and Dr. M L Sharma, ex-president, District Congress Committee, Bhiwani. Haryana Chief Minister Bhupinder Singh Hooda yesterday undertook a flurry of activities here, including addressing a state-level Parshu Ram Jayanti function, laying the foundation stone of a trauma centre and a 66-kv sub-station, inaugurating the administrative block of a government college and a sports meet at War Heroes Stadium. Supporters of former Chief Minister Bhajan Lal have started quitting the Congress in a phased manner. Japanese encephalitis that kills a large number of children across Haryana every year during the monsoon will finally be controlled. Technical education in Haryana will get a boost after the state government’s announcement that it had earmarked Rs 120 crore for such education during the current financial year. A Kurukshetra University committee and the Kurukshetra police have given a clean chit to two professors who had been accused of sexual harassment by a research scholar about a year ago. In a shocking incident three members of a family, including a four-month-old baby, were allegedly found dead in their house. Their bodies were found hanging from a ceiling last night. Two motorcycle-borne persons were killed when a school bus collided with their vehicle near Kheri Khatiwas village on the Jhajjar-Dadri road here today. District and Sessions Judge Atul Kumar Jain today sentenced 20 accused for sexually exploiting a minor girl. The victim had on October 18, 2001,told the police that three persons had raped her at a farmhouse near Behlolnagar village. Though the Department of Haryana State Minor Irrigation Tubewell Corporation (HSMITC) was closed down by the INLD government, grievances of its retrenched employees remain. The Haryana civil judges association (HCJA), which had been dormant for a long time, has been revived. Many former MLAs from almost all political parties in Haryana will join the BJP in the near future. The Punjab and Haryana High Court today issued notices to the Election Commission of India, the Delimitation Commission and the Haryana government on a petition challenging the final order of delimitation of constituencies in Gurgaon district. A resident of Ambala cantt died and another was injured when two robbers attacked them with iron rods last evening. An elderly man was shot dead by two assailants at Mandothi village of the district yesterday. The killing is stated to be an outcome of a long-standing rivalry between two groups, which has taken 22 lives so far. The district police today booked a driver belonging to the cavalcade of the Chief Minister who had rammed into two shops thereby injuring three persons. Driver, Rakesh Kumar, has been booked for rash and negligent driving. Farmers of Dadlana village, whose lands have been identified for being acquired by the IOC's petrochemical hub, have sought more time for rehabilitating themselves. A farmers’ delegation met the deputy commissioner and sought the rate prevailing in the market for their land. About 650 students were awarded degrees at the 44th annual convocation of DAV Girls College here today. Vice-chancellor of Himachal Pardesh University Anil Wilson in his convocational address laid stress on human values in the present times. A prisoner died under suspicious circumstances in the local central jail this morning. The deceased, Bhola, belonged to Barabanki. He had been residing at Ambala cantt for the past few years and was employed in a factory. Officials of the electricity board and vigilance department jointly raided a factory located on the Gohana road. A fine of Rs 1.19 crore was imposed on the factory owner for the alleged power theft. According to superintending engineer B.S. Dahiya, the factory was raided after a complaint was lodged in this regard. Two notorious criminals were arrested from Faridabad yesterday and their third accomplice today. Out of them the two had been absconding for the past three months. They had shot another criminal while he was being produced in a court at Hansi. Two sisters, Mandeep (13) and Harpreet (11), died late last night, whereas Jashnpreet (3-and-a-half-year-old son) breathed his last this morning at a private hospital. Manjit Kaur is still battling for life, sources say. Dr Nagpal, at whose nursing home the four were admitted, informed The Tribune that the “poisonous” substance was indeed lethal. Meanwhile, the police has registered a case under Sections 302, 307 and 328 of the IPC against Charan Singh and his first wife Kulwinder Kaur. However, S P Sanjay Kumar revealed that the initial investigations pointed a finger at Manjit. He clarified that it was a matter of indepth investigations to come to the final conclusion. He added that probably the consumption of celphas was the cause of the deaths. Inquiries revealed that Manjit was married to Lakhwinder Singh who died about 15 years ago. After his death she was made to stay with Charan, younger brother of Lakhwinder. At that time he was already married to Kulwinder. They have two children. From her first marriage, Manjit had two daughters, and she gave birth to a son after “marrying” Charan. In a complainant made to the police this morning, Baldev Singh, father of Manjit, alleged that both Charan and Kulwinder conspired to kill all of them. The three had allegedly developed strained relations due to the complexity in their mutual relations. Parents and relatives of Manjit took her away from the hospital to “some other place for a better treatment”. However, Charan has denied any foul play. He said he was “shocked”. He said he himself took them all to the private hospital and was now being harassed unnecessary. The Haryana government had on April 17 promoted H S Chhokar, assistant DEO, Fatehabad, to the post of DEO and posted him here against Vidya Wanti Kamboj, who was transferred to Kaithal. Chhokar joined at his new post on April 18, 2007. Today, Kamboj came armed with orders of the Punjab and Haryana High Court staying her transfer. The High Court, while hearing civil writ petition 50726/2007 filed by Kamboj today, has issued notice of motion to the government and other respondents for May 7, 2007, and, in the meantime, has stayed her transfer orders. Kamboj had challenged her transfer orders on the ground that she was merely 11 months away from her retirement. Hence, her transfer was against the government policy, which provided that no government employee could be transferred during the last year of his or her service. Kamboj joined her duties after furnishing an affidavit regarding court orders before the deputy commissioner, as she said she would be able to receive certified copy of the court orders by tomorrow. While the transfer of Kamboj stands stayed due to the court order, no fresh orders regarding the posting of Chhokar have been received so far. Jitender, who, along with Vijay, was harvesting at a granary at sarpanch Ramphal’s farm at Mumtazpur village near Kosli was allegedly killed by the latter with an iron rod yesterday. Soon after committing the crime Vijay fled away from the scene, but was incidentally spotted by Raju, brother of the deceased. He then conveyed this to Ramphal, who in turn informed the police. The Kosli police has registered a murder case against the suspect. Vijay, a resident of Bihar, and Jitender, a resident of Jholri village, near Kosli, had been working as harvesters at Ramphal’s farm for quite some time. The Rampura police claims to have busted an inter-state gang of vehicle thieves with the arrest of four persons, Praveen Kumar, Vijay Kumar, Amit Kumar, all residents of Jhajjar district, and Rajesh Kumar of Bhiwani district. They were arrested from a hideout on the Rewari-Narnaul road near Qutubpur. A country-made pistol, two cartridges, three iron rods and a motor cycle have been seized from them. A case of attempted robbery has been registered against them. ex-MLA and former member of the HPSC, Dharmpal Sangwan, ex-MLA, and Dr. M L Sharma, ex-president, District Congress Committee, Bhiwani. In a letter sent to the working president of the Haryana Pradesh Congress Committee, the leaders said they resigned "against the corrupt and undemocratic acts" of the state government. They have sent copies of this letter to the AICC president Sonia Gandhi and Janardan Dwivedi, in charge of the Haryana affairs of the party. Addressing a press conference, Jangbir Singh said the Congress workers across the state brought victory to the party two years back after a prolonged struggle. But the government forgot the promises mentioned in the party manifesto prior to the elections and Congress workers were feeling 'cheated'. They alleged that the people were distressed at the anti-people policies of the party, while corruption and goondaism were on rise in the state. In their letter, they described that dedicated workers were being sidelined and ignored while nepotism and regionalism were prevailing. They said the Bhiwani MP Kuldip Bishnoi had reiterated the statement of late Prime Minister Jawaharlal Nehru wherein he had called upon the "elected public representatives to raise voice if ruling party works against the democracy". Instead of patting the back of Bishnoi, the All-India Congress Committee and Pradesh Congress Committee suspended him from the party showing that the party had no faith in the policies and ideology of its great leaders. In a letter written to Sonia Gandhi, Bishnoi had mentioned against the land of farmers being sold to Reliance at a trivial amount. "The hand of the Congress which was with the common man was now with the richest industrialists like Mukesh Ambani", they quipped. While addressing a gathering at the Parshuram Jayanti function in Ambala City, Hooda exhorted people to emulate the principles and ideals propagated by Bhagwan Parshu Ram. The function was organised by Ambala City MLA Venod Sharma. While referring the demand put forward by Venod Sharma, the Chief Minister said a sewerage scheme for Rs 182 crore had been sanctioned for Ambala City. He also announced that a park in Sector 8 would be developed and named after Bhagwan Parshu Ram,that small drains costing Rs 11 crore would be constructed to drain out rainwater from the city and Naggal constituencies and a grant of Rs 10 lakh from his discretionary quota would be given for the construction of a Parshu Ram Bhawan. Hooda laid the foundation stone of the sub-station at Company Bagh in Ambala City and it would be constructed at a cost of Rs 5 crore. The Chief Minister said the government had sanctioned Rs 6 crore for setting up trauma centres at Sirsa, Rewari, Ambala and Yamunanagar. Meanwhile, a district sports meet organised by the United Basketball Club was inaugurated by Hooda at War Heroes Memorial Stadium in Ambala Cantt. Hooda also inaugurated the administrative block of the postgraduate government college, Ambala Cantt and laid the foundation stone of Rajiv Gandhi Sports Premises in Sector 10, Ambala City. Most of those who have quit the party so far are either those who could not get the party ticket in the last assembly elections or lost at the hustings. Almost all of them could not find a place in the new political set-up in which Chief Minister Bhupinder Singh Hooda and his supporters dominate. Besides district and block-level sitting or former office-bearers of the party, certain former legislators have also quit the party. They include former MP Jangbir Singh. Among the former MLAs who have quit the party are Mani Ram Keharwala (Sirsa), Dharampal Sangwan (Bhiwani) and Devendra Sharma (Kurukshetra). They have sent their resignations to AICC president Sonia Gandhi and AICC general secretary Janardan Dwivedi. They have given identical reasons for quitting the party. The reasons leave no doubt that they are supporters of Bhajan Lal. All of them have praised Kuldip Bishnoi, MP son of Bhajan Lal, who has been suspended from the Congress. They also said those Congress workers who made the party victorious in the state two years ago were feeling cheated because Bhajan Lal was not only denied the chief ministership but was also being ignored in the party. Since Bishnoi is believed to have postponed his plan to launch his own political party for the time being, the resignations by his father's supporters in a phased manner are believed to be an attempt to keep the limelight on the father-son duo till the "appropriate time" comes. After the fatal impact of the fever for more than eight years, a first-of-its-kind vaccination programme has been started in the districts of Karnal and Kurukshetra.The programme which started on April 15 will continue till April 30. About eight lakh children in the age group 1-15 will be vaccinated. Later, the programme would be extended to the districts of Ambala, Kaithal and Yamunanagar, said Dr N. C. Sharma, Director-General,Health, Haryana. Two years ago, 36 deaths were reported from the districts of Yamunanagar, Karnal, Kaithal and Kurukshetra due to the disease out of a total of 46 suspected cases of Japanese encephalitis (brain fever). In 2004 also,37 cases of suspected brain fever were reported out of which 27 patients died. In 2006, the state was able to contain the disease to some extent by spraying the delta metharine in the area before the onset of the monsoon. The piggeries in the region were also sprayed exclusively and the people living around these were told about the risk, said Dr Veena Chugh, Director, Malaria, Haryana. Last year, a total of 12 suspected cases of the disease were reported. Six of the patients died. Though the situation improved in Haryana last year, the neighbouring state of Uttar Pradesh witnessed more than 1,500 deaths due to the disease. The disease leads to more than 15,000 deaths throughout the world every year with 50,000 cases reported from the rural areas after the monsoon rain when mosquitoes breed prolifically, says Dr Pratibha Singhi, Professor , Department of Paediatric Medicine and chief of Paediatric Neurology at PGIMER, Chandigarh. Technical education in Haryana will get a boost after the state government’s announcement that it had earmarked Rs 120 crore for such education during the current financial year. Polytechnics and other technical education institutions run by the technical education department, which will admit students in an examination to be conducted on June 2, will now have a budget of Rs 120 crore as against Rs 29 crore during 2004-05. This has been done to primarily strengthen the infrastructure of the technical institutes. This was stated here today by parliamentary secretary Dillu Ram, who said the state government was laying special emphasis on imparting quality technical education to students in all polytechnics and engineering colleges. At present, there are 183 technical institutions functioning in the state, which include 44 colleges of engineering. Dillu Ram said efforts were being made to ensure placements for the maximum number of students passing out from the polytechnic and engineering colleges of the state. To achieve this objective, an e-placement portal had been introduced in the department which would have liaison with major employer portals in the country and abroad. He said new courses were being introduced in the polytechnics to meet the needs of industries. Possibilities were also being explored to start highly specialised and job- oriented technology diploma courses. Computer education was being promoted on a large scale in the state, he added. The research scholar had alleged in a complaint to the university authorities as well as the police that Dr M.S. Chauhan and Dr O.P. Gahlawat, professors in the physical education department, molested her when she had gone to them in connection with her PhD seminar on April 25, 2006. The university set up a gender sensitisation committee against sexual harassment (GSCASH) headed by head of the botany department Sharda Gupta to inquire into the allegations. The committee in turn constituted a five-member inquiry committee headed by Reicha Tanwar. The committee held that the allegations against the two professors were "completely baseless, false and fabricated and an effort to malign them." The Kurukshetra police has also recommended to the court that the case against the two professors should be cancelled as in its investigation the police found that the allegations were false. The police found the bodies of Sanjay, his wife Poonam and their only son, hanging with a hook in their ground floor house located in the Shaktipuram locality of the township. It is suspected that some domestic problem led to these people committing suicide. Neither any injury mark was noticed on their bodies nor any suicide note recovered so far, the police claimed. An elderly woman told TNS that on noticing the doors locked from inside till evening, she informed a cop residing in the locality. Getting suspicious, the police was called in and they broke open the door of the house and found the bodies. The shocked neighbours said only three persons were staying in the house owned by them. The couple had developed strained relations with other family members due to some domestic problem. Sanjay, who hailed from Uttar Pradesh, and was staying here for the past 15 years. His was working as daily wager and earned a meager income. According to information, the deceased identified as Mahipal and Akheram of Bhiwani district were going to Gurgaon on their bike.However, a private school bus ran over their vehicle and dragged them to a distance.The bus stopped only after it rammed into a roadside tree. Both bike riders died on the spot. The police has registered a case against the bus driver on the complaint of an eyewitness, a resident of Kheri Khummar village. District and Sessions Judge Atul Kumar Jain today sentenced 20 accused for sexually exploiting a minor girl. The victim had on October 18, 2001,told the police that three persons had raped her at a farmhouse near Behlolnagar village.They were charged with stripping the girl naked, taking her photographs and blackmailing her.The designate court for dealing with cases relating to atrocities on SCs and STs had earlier acquitted two accused, Rohtas and Sanjay,on benefit of doubt. The court ordered action against Bimla Devi, wife of Suraj Parkash Narang for abstaining during the hearing. The court sentenced Krishan Godara to 10 years’ imprisonment and imposed a fine of Rs 5,000 on him. Krishan Chander, son of Om Parkash, Subhash Chander, Sehdev, Vijay Pal, Dinesh Kumar, Mohan Lal, Rajesh Kumar, Raj Kumar, Harphool, Shakti Poonia, Suresh Kumar, Vinod Kumar, Subhash, son of Inderaj, Mohinder Kumar, Sushil Kumar, Sonu, Vijay Kumar and Bimla Devi were sentenced to five years’ imprisonment each besides a fine of Rs 5,000. Claiming this in a letter addressed to Chief Minister Bhupender Singh Hooda, one of the retrenched employees and their spokesperson G.S. Uppal said about 300 of them had not been given any sort of relief. Uppal said that those who died after July 30, 2002, the date of closure of the HSMITC had been given financial assistance of Rs 2.5 lakh each and those who had attained the age between 55 to 58 on the cut-off date i.e. May 18, 2006, as declared by the state government, were granted financial assistance of Rs 1 lakh each. Moreover, those who were below 55 years on the cut-off date were provided alternate employment in other government and semi-government departments. But those who were in service on the date of its closure and had crossed the age of 58 years on or before May 18 had not been given any sort of financial assistance despite the fact that they had lost their service up to four years. Civil judge (senior division) of Fatehabad Sushil Kumar Garg has been elected its president. Sangeeta Rai Sachdeva, additional civil judge (senior division), Kurukshetra, was elected vice-president; additional civil judge (senior division), Ambala, Lal Chand as secretary; Amit Garg, civil judge (junior division), Karnal, as joint secretary; and Sanjeev Arya, additional civil judge (senior division), Narnaul, as treasurer. R. N. Bharti, chief judicial magistrate, Karnal, was elected the spokesman of the association. Manisha Batra, civil judge (senior division), Rohtak, and C. L. Mohal, civil judge (senior division), Jagadhari, were elected patrons-in-chief of the association. Claiming this here yesterday Haryana BJP president Atam Prakash Manchanda said his party was scrutinising the names of the leaders who wanted to join it. He said the number of such leaders could be around 20. Manchanda said the acceptability of the BJP in Haryana, particularly in the rural areas, was on the increase. A large number of villagers, he said, now openly appreciated the governance of the Vajpayee government as compared to that of the UPA. Ruling out the possibility of any alliance with other parties in Haryana, Manchanda said the BJP was engaged in strengthening its base in the state. When asked if former Chief Minister Bhajan Lal would join the BJP or would form a separate party and then have an alliance with the national party, Manchanda said neither Bhajan Lal nor the BJP had contacted each other so far. "For the BJP, he is still a senior leader of the Congress and whether he will form a separate party, only he can give an answer to this question," he added. The order passed on February 15 had directed the readjustment of constituencies in the district and also the name of one constituency had been changed. The petition filed by Virender Singh, son of former Haryana minister Dharampal Singh, stated that the order had been given without following the principles enshrined in the Delimitation Act and the Representation of the People Act, 1950. According to the information, two friends, Devender and Lakshman, were sitting in the ground of BM Model School at Ambala cantt when they were attacked by two robbers. Lakshman suffered injuries in the head. The robbers snatched Rs 6,000 from them and fled from the spot. 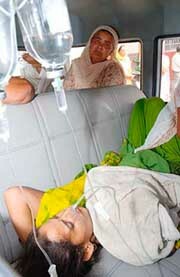 Lakshman was admitted to the local civil hospital where doctors discharged him after a few hours. He was rushed to the hospital again after his condition deteriorated in the morning. He died at the hospital. The relatives of the deceased alleged that he died due to the negligence of the doctor. They said he should have been referred to the PGI, Chandigarh. The hospital authorities said an inquiry would be conducted into the matter. The police has registered a murder case against two persons. Police sources said Mahender Singh (55) was sleeping in his house when two persons knocked at the door. As he opened it, they pumped five bullets into him. He died on the spot. A case has been registered against Raju, alias Dandu, a resident of the same village, on a complaint of brother of the deceased, Jagat Singh. The victim reportedly belonged to the Ramphal group while men of the rival Sunda group murdered him. where the Chief Minister had gone in connection with the ongoing Assembly elections. They also urged him to review the acquisition plan as small parts of their land, which would be of no use once it was acquired, had been left out of it. He warned the youth against the seductive aspect of material world where values and relationship were bargained and wighed in monetary terms. Earlier, principal of the college Sushma Arya presented the annual report of the college. Former vice-chancellor Bim Singh Dahiya was also present on the occasion. According to the information, the railway police had arrested him on the charge of travelling without ticket. He was yesterday produced before the Railway Magistrate who sentenced him to three-day imprisonment as he could not pay the fine. Last night, he complained of restlessness. The doctors at the jail examined him and referred him to the civil hospital. He was brought to the civil hospital by the jail authorities early morning where doctors declared him brought dead. SDO Rajinder Singh Khanger said the connection was issued in the name of Siya Ram Garg and the power theft was noticed when they checking factories consuming more than 500 KW of power. According to district police chief, they have been identified as Salim of Hansi and Yogesh of Sampla in Rohtak district. The third criminal, Surinder Kapur, belonged to Shivpuri in Madhya Pradesh.